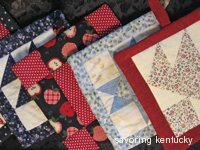 I asked for help locating replacements for much used, quilted potholders -- and a beautiful person I've never met sent new quilted potholders! You can see in the photo how wonderfully she made new versions of my old treasures. I asked for Kentucky growers to sell me celeriac and make me swoon with cardoons, and Meadowbloom Farm-ers say they are underway with these exotic vegetables. How delightful! Can year-round lettuce be far behind? Perhaps I'll get to grow my own, if we in Lexington put a priority on raising ourselves a GardenHouse, as happened with the Allen Neighoborhood Center'sHunter Park GardenHouse in Lansing, Michigan.